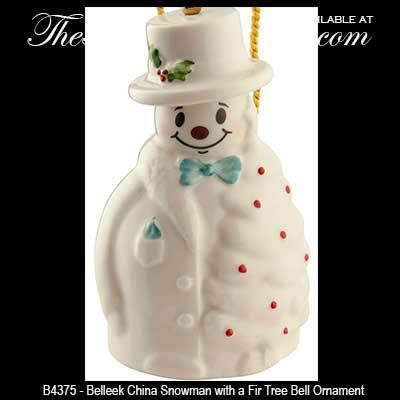 This Belleek snowman ornament was Introduced in 2015. This Belleek ornament is an Irish snowman who is holding a fir tree for Christmas. The Belleek bell ornament features a hand-painted shamrock on his back along with holly and berries and blue accenting. The Belleek snowman ornament is made of fine china and measures 2" wide x 3 3/4" tall and it is ready to hand with the included gold tassel. Belleek snowman ornament is made of fine china and features an Alpine outfit. 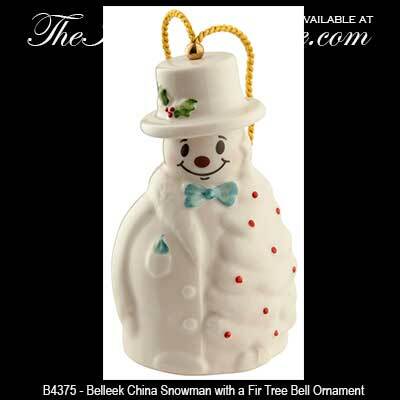 Belleek ornament is a bell that is crafted of fine china and features a snowwoman.